To give you a sense of scale, it takes exactly 15 minutes to walk from #1 (where Pascal and Laura are staying - which is Pascal's parents' house) to the train station. 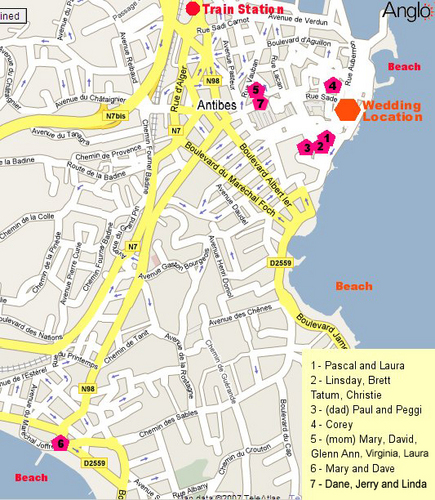 It takes 30 minutes to walk from Mary and Dave's hotel, which is in Juan les Pins, to the location of the wedding… but there is a train station in Juan les Pins. Please send me your hotel info, so I can put you on the map!